The only time I visited the Gargano, a severe rain forced me to buy an umbrella in a village shop. 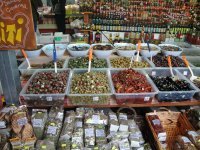 We didn’t make it to Vieste, but this post from Kimberly Sullivan has inspired me to put it on my list. 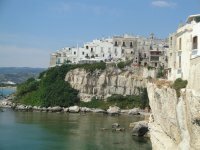 A photo doesn’t lie and Vieste, this lovely, perched seaside town located in the Gargano peninsula (the spur of the Italian boot) in the region of Puglia, honestly is this picture-perfect. The area has ancient origins, evidenced by the 3rd century tombs and Ancient Greek vases discovered around the town. The town and the entire coastline suffered numerous attacks by Saracen and Ottoman invaders in the 16th and 17th centuries. Dotting the coastline are numerous, impressive watchtowers, which once served to warn the population of invaders arriving by sea. More recently, this little fishing village has developed as a popular tourist site. 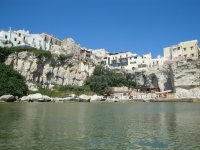 Vieste is a wonderful holiday spot. The town itself is filled with picturesque streets and lovely views over the sea.